Thank you for the kind wishes sent my way on Tuesday regarding the job interview. Although I don't know yet whether I have been successful, the 3 hours interview (sooo long) did go well and I managed to spend a couple of hours walking around Bern old town. I never imagined Bern to be quite so different from Zurich (or so far away from Meilen: it is a 2 hours and a bit commute door to door...) and I am quite excited to show you some of the pics I have taken. 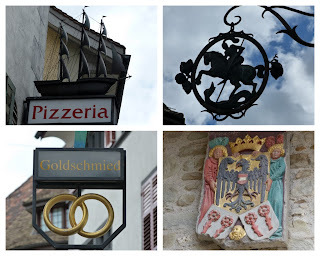 I am writing today my third and last post on my visit to Rapperswil (almost 2 weeks ago). My first post focused on the old town square and the castle while the second took you on a tour of the rose gardens. This post will be an assortment of snapshots taken in the streets of the old town which I hope will give you a better feel for the place. Enjoy your tour! I find walking around old medieval streets to be both mind-blowing (I mean it is like travelling back in time!) and sometimes a bit scary when you start to imagine how dark and smelly those streets would have been back then. Some of the houses in Rapperswil date back from 1630! Isn't it amazing? You can also find some quirky modifications added to these old houses like this cat ladder. Genius! Thank you for dropping by today. I will sort my Bern photos this weekend to share them with you in a future post. Bye for now! Look at that cat ladder! I can't see my cats using anything like that, they're far too obtuse!